Establish a handsome setting in your home decor with this wood bed. 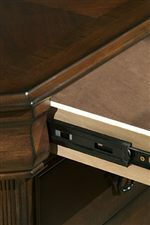 The piece carries a burnished cherry finish and consists of poplar solids as well as birch veneers. The combination creates a truly rich and sophisticated look. With a wealth of earnest elegance, this headboard and footboard bed is sure to please. This bed is available in queen, king, and California king sizes. The Sheridan King Bed w/ Sleigh Headboard by New Classic at Michael's Furniture Warehouse in the San Fernando & Los Angeles area. Product availability may vary. Contact us for the most current availability on this product. 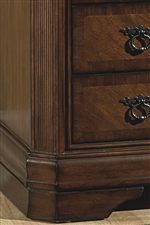 The Sheridan collection is a great option if you are looking for Traditional furniture in the San Fernando & Los Angeles area. 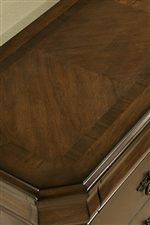 Browse other items in the Sheridan collection from Michael's Furniture Warehouse in the San Fernando & Los Angeles area.